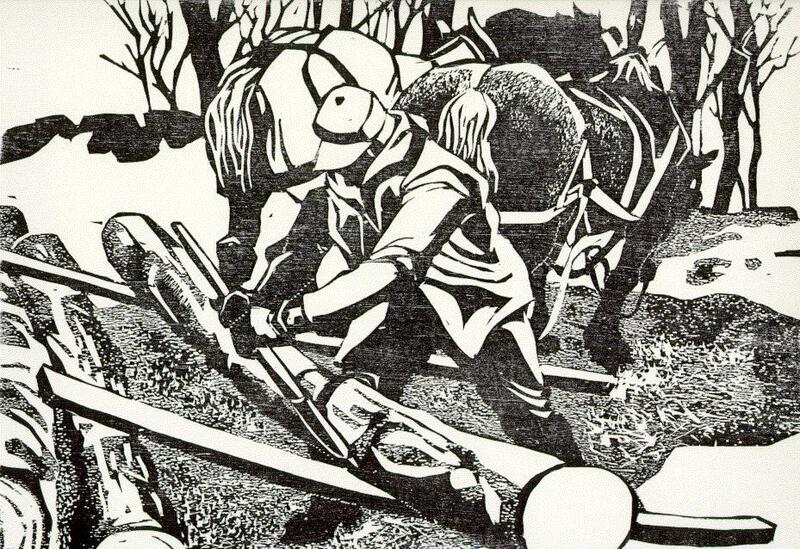 Horse Logging. Kent, Wash.: Red Door Studio, 1987. 29 x 39 cm. COLOPHON: Book 15 in a series of limited edition books created by Artist-Author, Danny Pierce, in the Red Door Studio. The illustrations are original woodcuts printed direct from the blocks on Stonehinge, a rag paper made by the Rising Paper Company. The text is printed on Nidiggen, an import from Germany. The typeface is Caslon Old Style No. 471 cast by ATF foundry, boxed in Belgian linen and tooling calf. Copy 24. "I heard through friends in Corvallis, Oregon that there were several horse loggers near there. When I expressed a desire to see the operation, it was arranged. Julia and I drove down from Washington and were introduced to the logger. We arrived in time to watch the harnessing and loading into a truck of two beautifully matched Belgian mares. The logging site was nearby which made the logger's operation easy. We spent the day following the team and photographing the activity. This was in the summer and I made plans for winter shots, but unfortunately this failed to materialize as it rained too often making it impossible to haul the Christmas trees with horses. They were hauled out of the hills by helicopter. 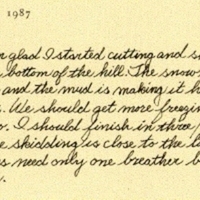 "In March, Julia and I were on our way to New Hampshire to research a book on maple syruping. Storms had dropped plenty of snow and spring weather was slow in coming. The sap would not run. 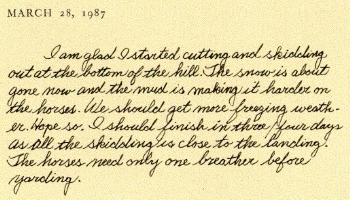 The first thing we saw was a man logging off the cottonwood trees to improve the growth in a sugar orchard. 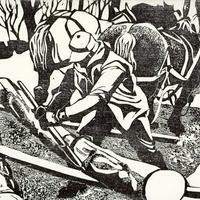 He was using a team of horses to skid the logs over the snow to a landing next to the main road. In that same week the brother of the man we were staying with said we could observe him clear a ten acre wood lot for a horse pasture. 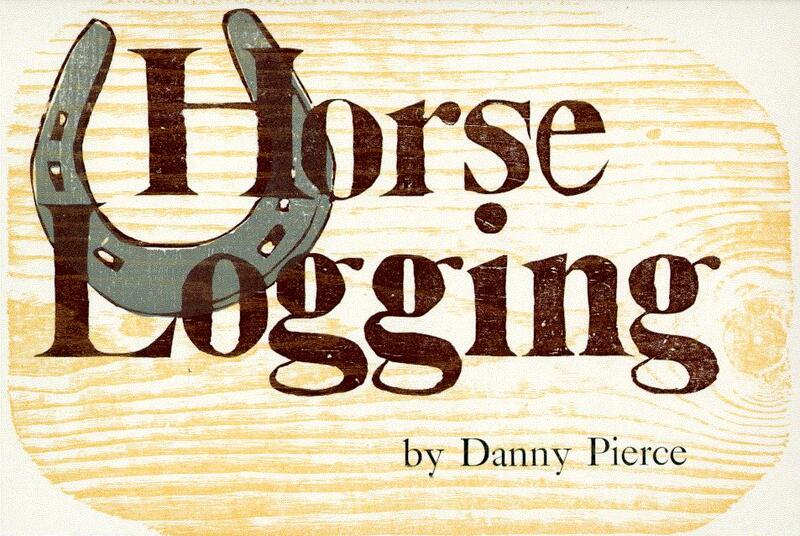 We were able to complete the seasons for the book on Horse Logging."